I've been obsessing over the idea of dyeing old linens. I love to hunt for vintage goodies, and I can tell you thrift stores across America are packed with old blankets, sheets, table cloths and napkins. I know...ewww...cooties! It grosses me out too. But many of these linens are still very much usable, they've simply fallen out of fashion or are faded. To avoid bringing home nasty pests, all you need to do is throw your item in a plastic bag and tie it up tight. When you get home, remove it from the bag and put it straight into the washer for a long, hot wash with detergent and non-chlorine bleach, then dry it on high. If the item is delicate, you can also have it dry-cleaned. Both methods should kill just about any germs or bugs that may be lurking. 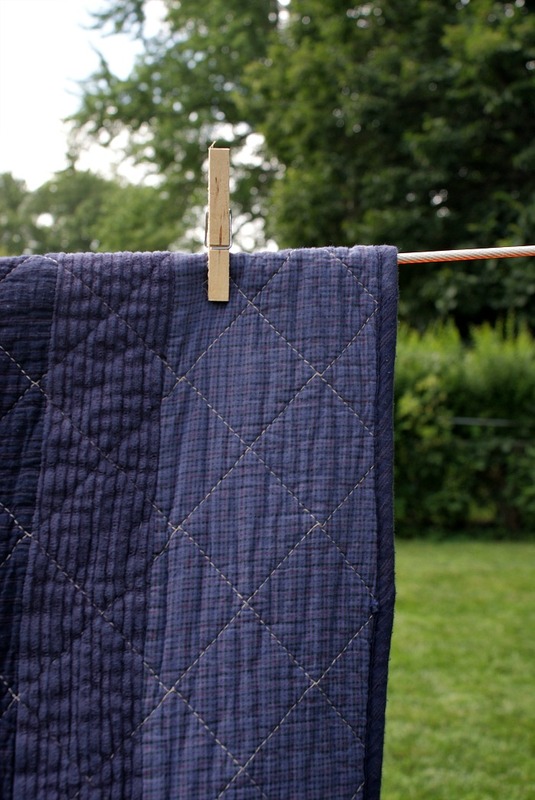 So, now that we are over the ick factor, let's talk about my experiment with over-dyeing a thrifted quilt! A couple weeks back, I started looking on eBay for quilts and it turns out most of the decent options seem to go for $60 and up, plus shipping. 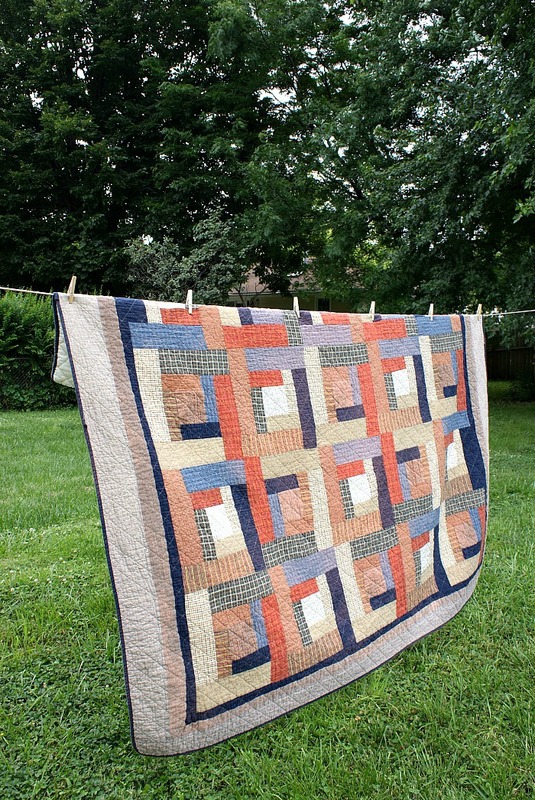 Fair enough for a handmade piece, but too high for a science experiment that could result in a jacked up quilt. With eBay out, I started keeping my eyes peeled at thrift stores and pretty quickly came across a mass produced, full size quilt. It doesn't have the coolest pattern and the back and stitching are synthetic (we'll get to that problem later), but for ten bucks I figured I could experiment out without having too much remorse if it didn't work out. 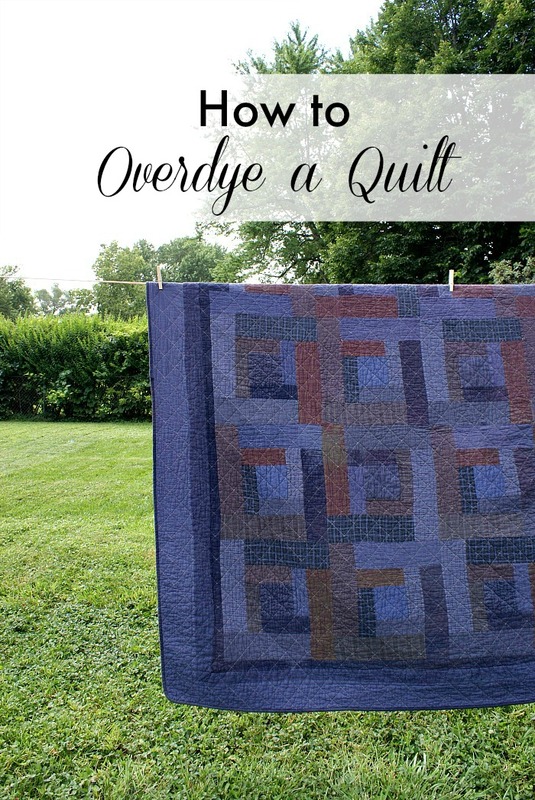 As soon as I found the quilt, I started researching how to dye it. The fist thing I discovered was that natural fibers work best for dyeing. The back of my quilt and the stitching are synthetic, which meant the dye would take, but not very well. Darn it! The second thing I learned is that you need really hot water for the dye to work best and that's why a lot of smaller items are dyed on the stove top. 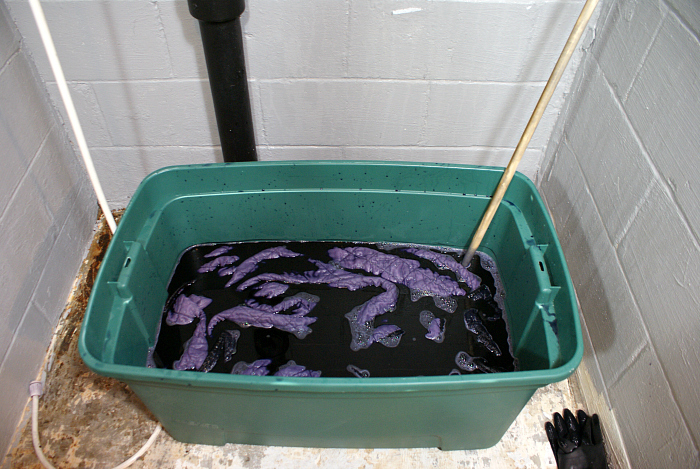 The third important thing I noted, is that fabric dye will likely stain a bathtub. So, knowing that I needed really hot water and a large tub, I decided to put a plastic storage bin in our basement shower and fill it with hot water. Before we get to that, here is a list of supplies to gather. 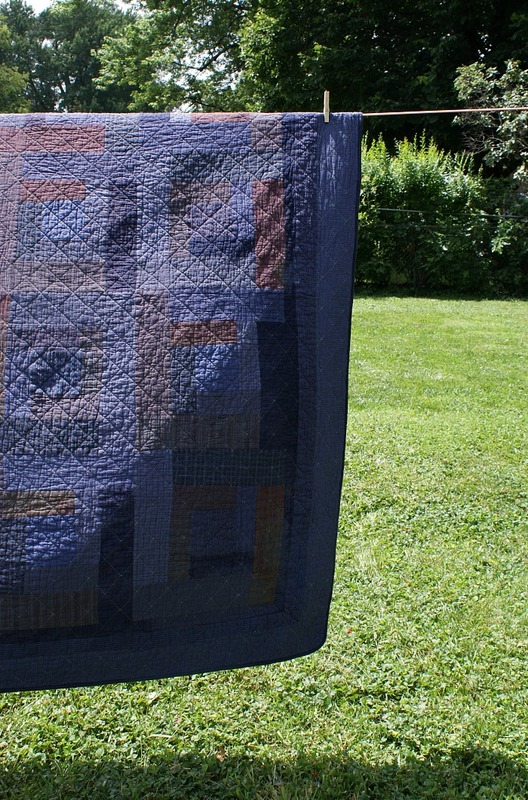 Quilt or blanket - natural fibers like 100 percent cotton will work best! A little disclaimer: One attempt at dyeing clearly doesn't make me an expert, I highly recommend reading up at Rit Studio before you start! Also, please, please don't try this if you live in a drought stricken area, this project requires so much water that I've vowed to take two minute showers for at least a week to make up for it! Next, I mixed up the dye bath. Jesse helped me hook up a hose to the shower head so I could add about fifteen gallons of hot water to the plastic tub. Then I added three bottles of dye, a squirt of dish soap and two cups of vinegar. The Rit Studio instructions say to use one cup of vinegar, but I wasn't sure if that meant one cup per pound of fabric or one cup no matter what, so I used two. I should send them and email and ask for clarification. I set the timer on my phone for thirty minutes and started swishing and stirring the fabric using a dowel with a rounded end. According to what I read, you need to move the item around constantly for even dyeing. After a few minutes though, I was sweating and wanted to refill my wine, so I took a two minute break, which didn't seem to hurt anything. After a few more minutes, I noticed the rod might be damaging the fabric, so I took another break, ditched the rod, and used my gloved hands to move the fabric around. After thirty minutes were up, I started rinsing out the dye with warm water. 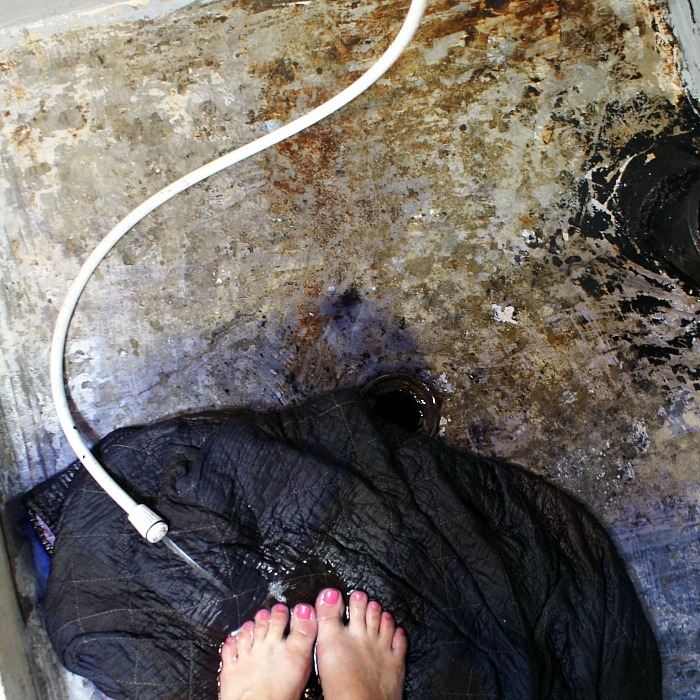 At first, I tried rinsing the the quilt in the plastic tub, but that was awkward, so I piled it on the floor of the shower and started using my feet to press out the water and dye. I also feel squirmy about sharing my chubby nubby toes, but at least they're painted, I guess! I continued spraying the quilt with hot water while I made baby steps all over, picking up the quilt and turning it about. After about twenty minutes, I'd had enough and decided to let the washing machine do the work. 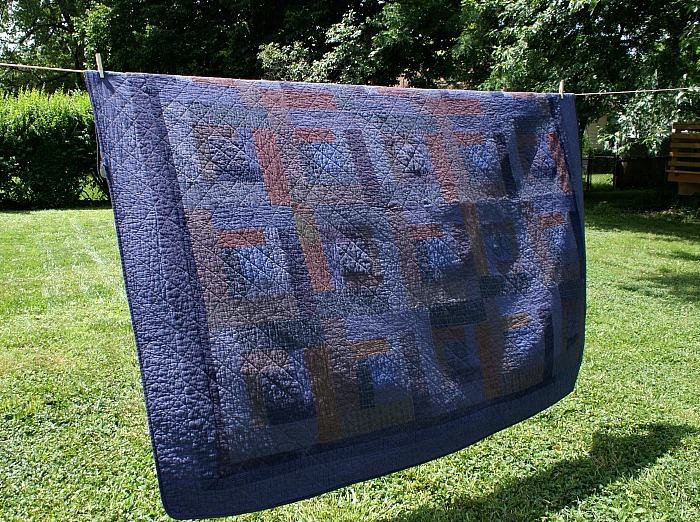 I ran the dyed quilt through a rinse cycle, followed by a wash cycle with an old towel (to absorb any stray dye), followed by a second rinse cycle. Like I said, this project requires a lot of water. After it was thoroughly rinsed, I dried the quilt with another old towel and then hung it up on the laundry line for a bit. The dye remover smells kinda funky, so hanging the quilt up in the fresh air and sunshine helped to remove any remaining odors. Overall, I'd say this was a pretty successful first attempt at over-dyeing; I think I could take on a vintage quilt if I find one for the right price! Living in Nebraska, we can always use extra blankets in the winter, so this over-dyed quilt will work great. Plus, it will be handy for picnics in the summer and for wrapping up cozy around the fire pit in the fall. 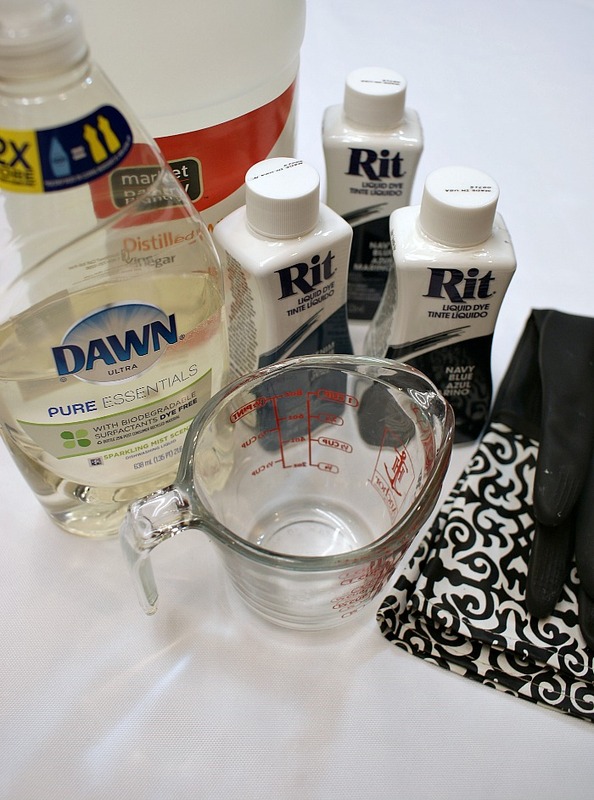 Have you ever tried dyeing fabric? How did it turn out? Do you have any lessons to share? I'd love to hear about it in the comments! Fun! 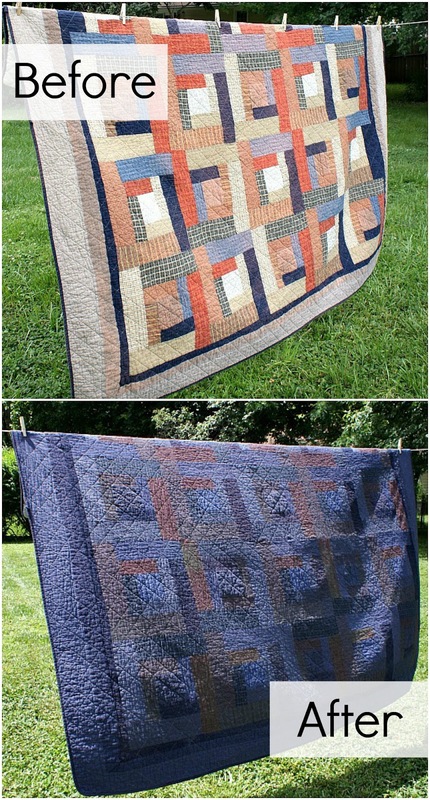 I never would have thought to die a quilt! It was fun, Heather! I can't wait to find another one!